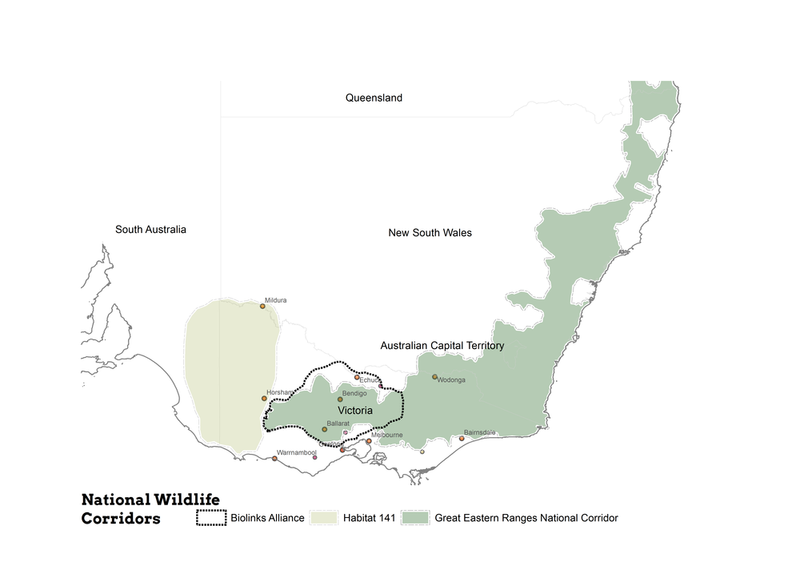 Biolinks Alliance is the crucial link between two large wildlife corridors - the Great Eastern Ranges National Corridor and Habitat 141, running along the North-South 141 degree latitude line. Biolinks Alliance works to restore and reconnect central Victoria from the Grampians in the west to the Victorian Alps in the east and from the Murray River to the Macedon Ranges. Biolinks Alliance member groups have identified the value in working collaboratively across landscapes with similar ecological, social and economic challenges. Three large-landscape regions frame Biolinks Alliance’s regional collaboration, planning and action. Landscape-scale restoration is needed in the highly damaged and fragmented ecosystems of the Central Goldfields to boost ecosystem diversity, health and resilience – especially in the face of climate change. An inspirational regional landscape collaboration with the vision of creating ‘a healthy and connected landscape between the Grampians (Gariwerd) and Pyrenees that supports our people and our biodiversity’. Partnering to restore key habitat and connections through Victoria’s central uplands. The arc of ranges around the outskirts of Melbourne will play a vital role in providing critical refuge areas for native species under pressure from a northwards-expanding Melbourne population and a southwards-movement of more arid climatic conditions.